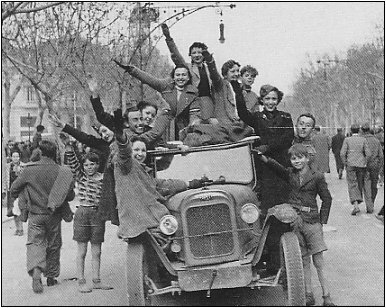 Liberation of Barcelona. 1939. A photo and a story. Nationalist troops began entering Barcelona, quickly suppressing any resistance by Republicans. On the first tank that entered the city sat a smiling German Jewish girl with her arm raised in a Roman salute. She had been imprisoned by Republicans for being Trotskist and was freed by the Nationalists from a prison in Las Cortes. There were 5 days of paseos, during which the surviving falangists of the city, embittered by suffering, killed whom they liked with impunity. I cannot understand how anybody can call the final victory of a side which fought for example under the motto "Death to intelligence" (Millan Astray) against a democratic elected government a liberation. But people are free to construct their own picture of history. 3.- If the lady was imprisoned for been troskist, it’s not very appropiate to raise her arm saluting as a fascist, unless newly converted into this. 4.- If the lady actually was a troskist and this would be found by the new rulers, most likely this lady would go again into prison to be later shot after passing through a martial court. Another alternative, as she seems to be German, would be to hand her over to the Gestapo friends. Being Jew, it’s easy to guess what would happen to her. 5.- "Liberation" of Barcelona ? If you visit Barcelona today, you wont find anyone using that term to describe the arrival of the Francoists to the town of their grandparents. How can be said "liberation" when the new system was a ferocious dictatorship ? Actually I visited Barcelona. I found people who use the term "liberation" and I saw ono of the first photos of the city after their release. It is not about impune revenges or triumhalistic parades, but of a Holy Mass. The first public mass since 1936. One can see a very very great crowd. No one can deny Franco's stuborness in not recognizing nor respecting the authentic regionalism. It was a great mistake. Franco didn't just refuse to respect regionalism, he attempted to wipe it out completely. Absolutely true. The same can be said of the basques. It is true, too. But I only would like to point out that in a great degree those bias were as far as regionalism was anti-spanish. It was not a justification. beauregard61 wrote: The topic reminds me of the "liberation" of Jerusalem in the first crusade. Jerusalem was also liberated by the crusaders (as we know this city of Christians and Jews was conquered by Arab Muslims, so the reconquest of Jerusalem is a liberation). Excessive violence of the victors is totally another story. I cannot understand how anybody can call the final victory of a side which fought for example under the motto "Death to intelligence" (Millan Astray) against a democratic elected government a liberation. 1. I don't think that Millan Astray was a leading ideologist of Nationalists. So I don't think that it's right to say that Nationalists fought under his motto. By the way, his words were 'Death to intelligentsia' (or "Death to intellectuals"). Just remember that Franco removed Astray from his office after this incident. To say that Nationalist side "fought under the motto "Death to intelligence'" is the even graver distortion of truth than to say that all Republicans fought under mottoes "We will create a dictatorship of proletariat and this means repression against capitalists and rich classes" (communist leader Largo Cabaliero) or "'Catholicism must be swept away implacably" (editorial of CNT, the leading libertarian organ in Madrid). 2. A ''democratic elected government" can be turned in a dictatorship. And people have an unconditional right to raise against such government if it violates their freedom. H.Thomas says that there were 'separate points of resistance'. I've never said that this picture depicts a tank and this very woman. Just a few women, men and children celebrating their victory. I don't think that she was 'converted' but I think she was glad and grateful for her release. It was not uncommon for Republicans to shoot all political prisoners during a retreat. By the way, not only falangists or Italian fascists used this salute. This salute was common for all Nationalists, majority of whom were nor falangists nor fascists. I have never heard that Franco handed Jews to Germany. More than that a lot of German and European Jews found refuge in Franco's Spain. And I don't think that this girl 'most likely would go again into prison to be later shot'. It was possible but not 'most likely'. 5.-...How can be said "liberation" when the new system was a ferocious dictatorship? Reds were a lot worse. Last edited by Kurt_Belarus on 01 Jan 2006 20:38, edited 1 time in total. Well, this was an issue of public health. Commemorations of those guys it would be like have monuments for Jack the Ripper, Al Capone or Dillinger. Well, this was an issue of public health. I don't think you are right. It's pity, but Franco actually tried to suppress Catalan culture. And I think it had nothing to do with public health. Kurt_Belarus wrote: H.Thomas says that there were 'separate points of resistance'. At the Llobregat river crossing. Is, or was this river in Barcelona?..or on the outskirts? Kurt_Belarus wrote: I've never said that this picture depicts a tank and this very woman. You are using it to illustrate your point. Ok, I can go with that. But of course it does work both ways. Kurt_Belarus wrote: It was not uncommon for Republicans to shoot all political prisoners during a retreat. Again, a generalisation with no source. Kurt_Belarus wrote: Reds were a lot worse. How many more times are we going to see generalisations such as this. iwh wrote: At the Llobregat river crossing. Or during the whole operation. a generalisation with no source. T.Hugh and others. In Castellon for example. As for my generalisation, I can prove my words with examples - see what Reds did in Russia, Ukraine, Belarus, Lavia, Lithuania, Estonia, China or North Korea. You did not understand me. I agree even with iwh about Franco's reppresion of the true regionalism of Catalonia and Basques. Unfortunately National Spain's regime was stained with this centralism. I say again it was a serious mistake. When I say"public health" I am talking about removing inscriptions related to Durruti, Ascaso and Ferrer, because these guys do not deserve any kind of tribute. They were criminals. Buenaventura Durruti was a ferocius savage anarchist who (among many other things) killed Cardinal Soldevilla in 1923. He also incite the martyrdom of the claretians of Barbastro. Francisco Ferrer was no a teacher but an agitator. He was behind the attempt on Alfonso XIII's life in 1906. So I say that honoring these guys is like honoring Jack the Ripper, Al Capone or Dillinger.